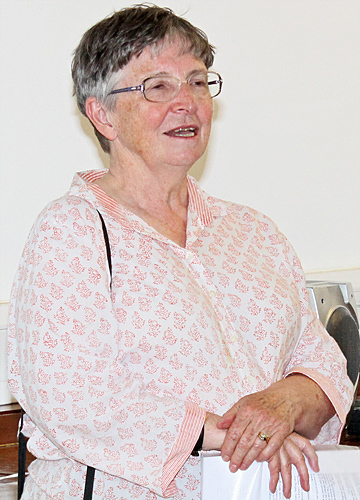 The Club’s President, Joan Bingley, opened the meeting with a brief introduction to slides for polarised light, which became popular for their “wow” factor in Victorian times when they would have been viewed on a polariscope, a compound microscope equipped with 2 Nicol prisms and a set of selenites. 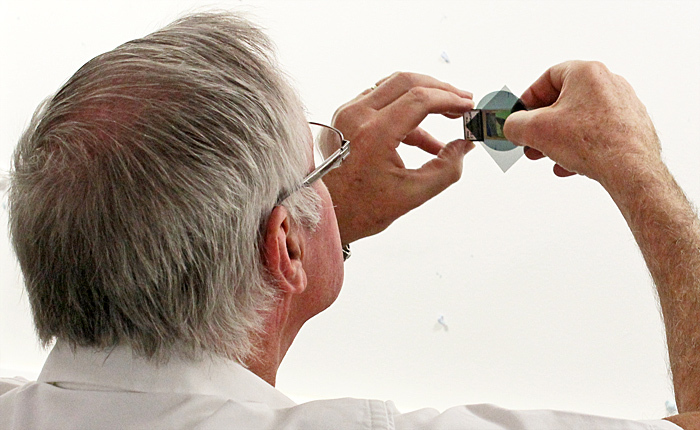 Today, the Nicol prisms have been replaced by a polariser (below the specimen) and an analyser (above the specimen), and the selenites have been replaced by wave plates or makeshift retarders. 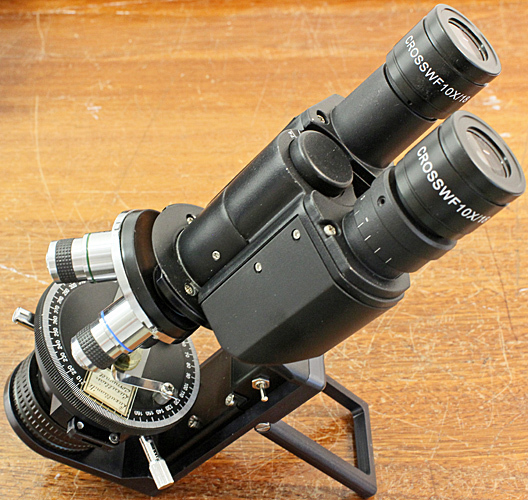 It is not usually necessary to use expensive accessories from microscope manufacturers. 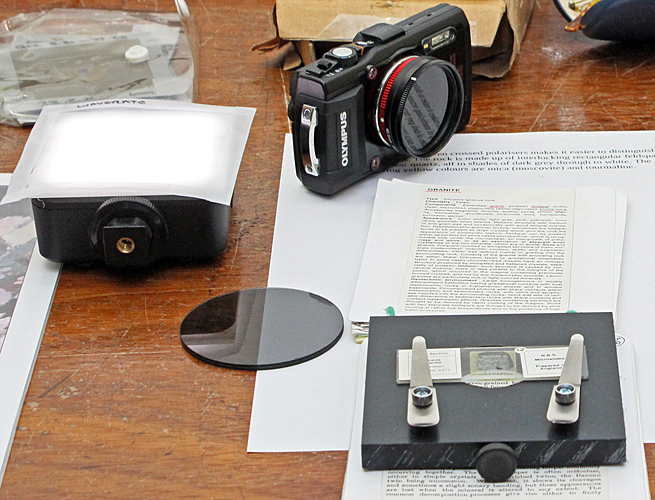 A linear polarising filter from a camera can be used as the polariser, and a disc of polarising film can be used as the analyser. Cellophane® or some types of plastic packaging can be used as a retarder – it is easy to experiment. With the polariser and analyser in place, look through the microscope and rotate the polariser until the view is as dark as possible, called maximum extinction. Then introduce a suitable specimen and it will appear brightly lit and probably coloured. Rotate the specimen, and you may see different colours. 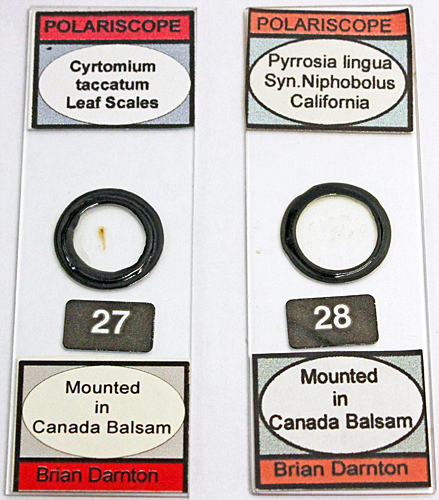 If you have a retarder, place it above the polariser and the colours of the background and the specimen will change. Rotating the retarder will probably change the colours. 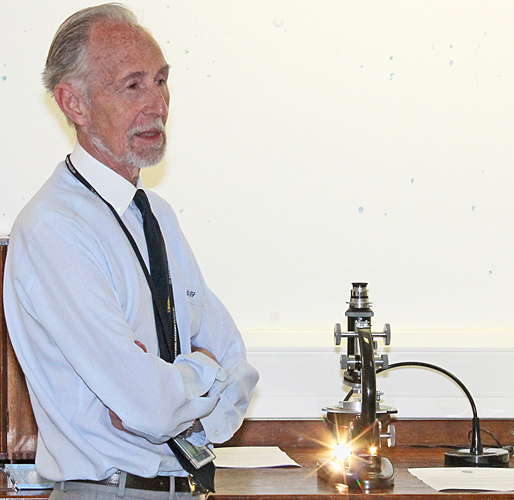 For more information on polarised light microscopy, see The Magic of Polarised Light by Don Thomson, and Polarized Light Microscopy – Microscope Configuration by Savile Bradbury et al. in the Microscopy Resource Center. 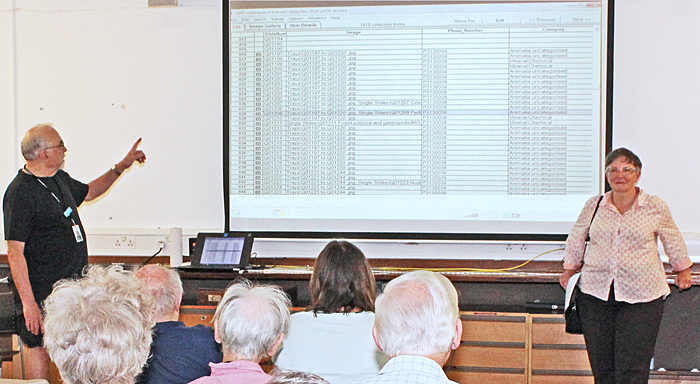 Before members were asked to introduce their exhibits, Paul Smith gave us an introduction to Recollector, a collection management system that is being considered for use with the Club’s collection of around 20,000 microscope slides. 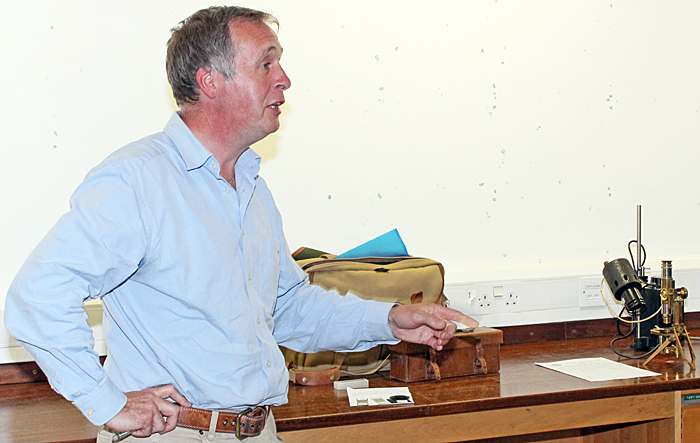 Jacky McPherson has cleaned up the data for the E. D. Evens slides, and Paul used this for the demonstration. 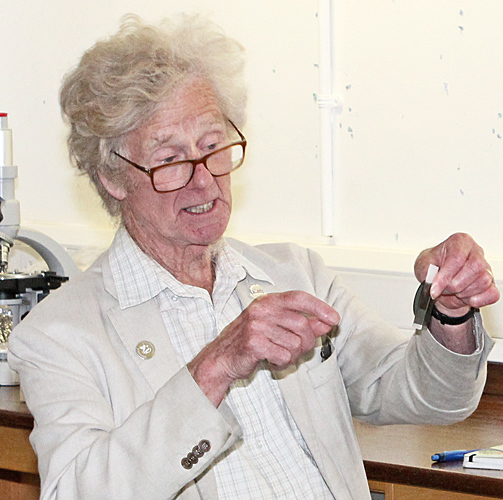 Joan Bingley showed the only example of crossed polarisers under a stereomicroscope, using an NBS Polarspex with a slide of fern scales made by Brian Darnton. 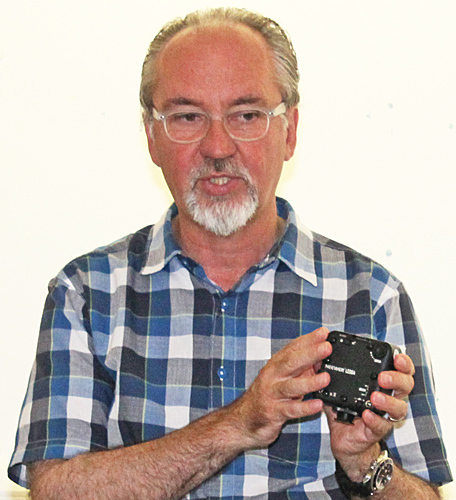 Kit Brownlee showed 3 slides that Brian Darnton had made as a tribute to the Victorian mounters who made slides “for the polariscope”. 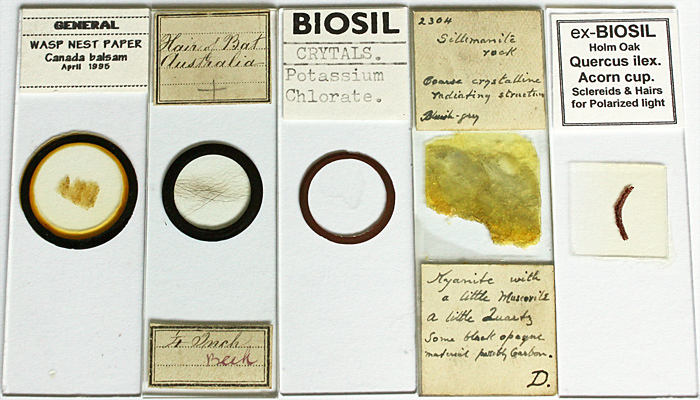 Kit’s slides were needles of natrolite and scales of 2 ferns, Cyrtomium falcatum and Pyrrosia lingua. 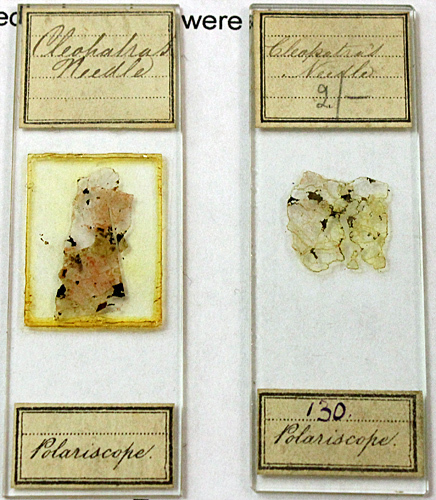 Dennis Fullwood used one of the Club’s James Swift polarising microscopes to show 2 antique slides. The Edmund Wheeler slide of a thin section of syenite from Cleopatra’s Needle showed the expected range of colours under crossed polarisers. Dennis had recently bought a Darlaston slide of a brown ant (Formica fusca L.) and unfortunately it had been thoroughly cleared so there was no trace of birefringent muscles. The lighting was modern, an Ikea Jansjö LED work lamp. 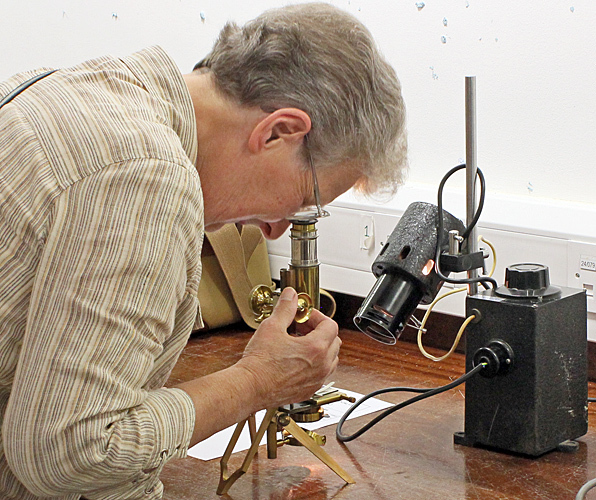 Phil Greaves brought a small, brass James Swift microscope that folds to fit into a rectangular leather case. 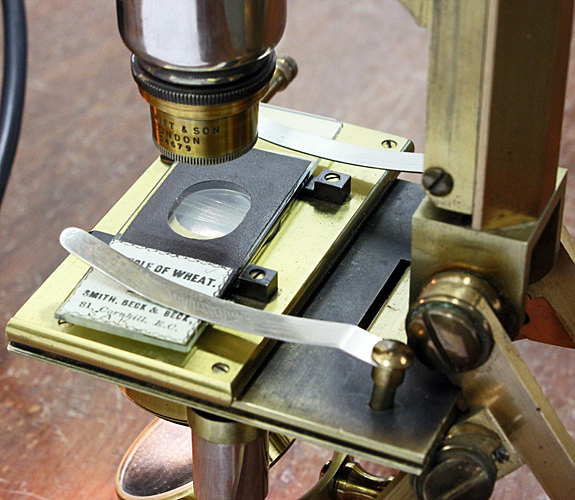 His slide was also antique, a Smith, Beck & Beck preparation of cuticle of wheat. 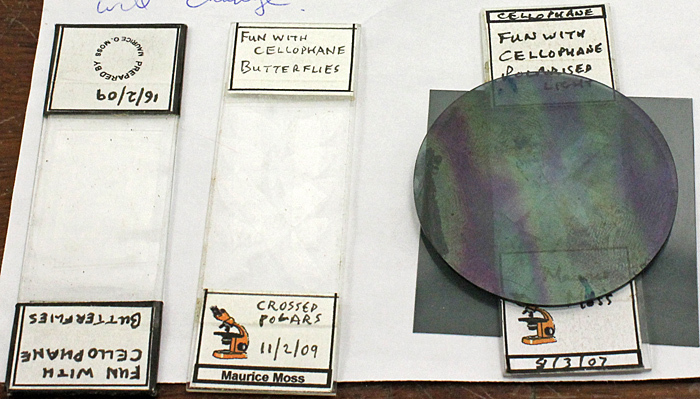 Maurice Moss brought 3 slides with multiple layers of colourless Cellophane that revealed coloured shapes when viewed between 2 pieces of polarising film. Cellophane rotates different wavelengths of polarised light by different amounts. With the 2 polarisers set for maximum extinction, rotating the slides changes the colours. Stephen Parker brought a microscope that we had not seen before, the polarising version of the portable microscope designed by Yuval Goren. 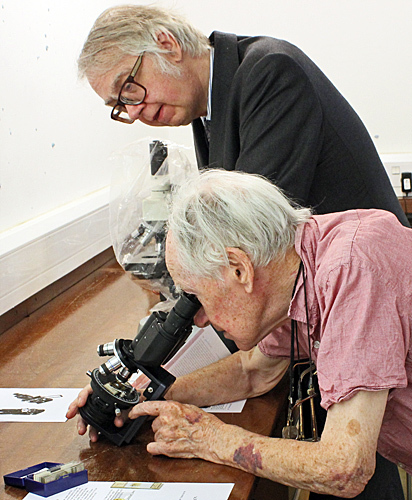 He used it to show a good assortment of thin sections of minerals, luxallianite, Cleopatra’s Needle, 3 NBS slides of Jurassic oolite, Aberdeen granite and Derbyshire basalt, and 4 slides of Derbyshire limestone with microfossils. John Tolliday has built up a portable system for close-ups and macro photography (up to 44×) based around his waterproof Olympus TG-4 camera and a Neewer LED64 video light. He showed it with a polarising filter, polarising film and a retarder, plus a stage for slides that he had made from black nylon. The components are described in the April 2017 Bulletin, pp. 16–20. 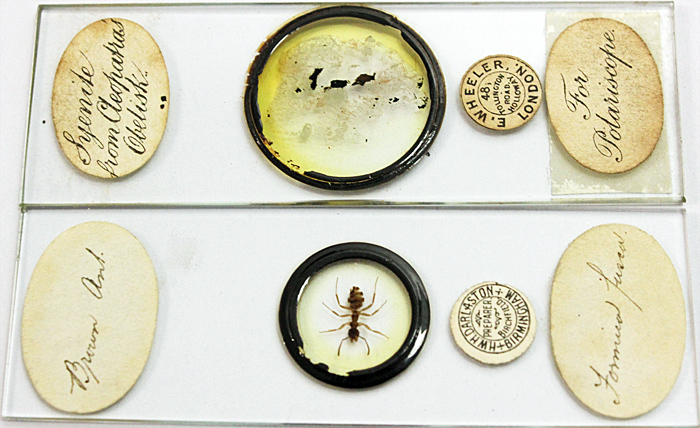 Alan Wood brought a few slides from his collection, including common ones (crystals, mineral section, hair) and some unusual ones (acorn cup, wasp-nest paper). 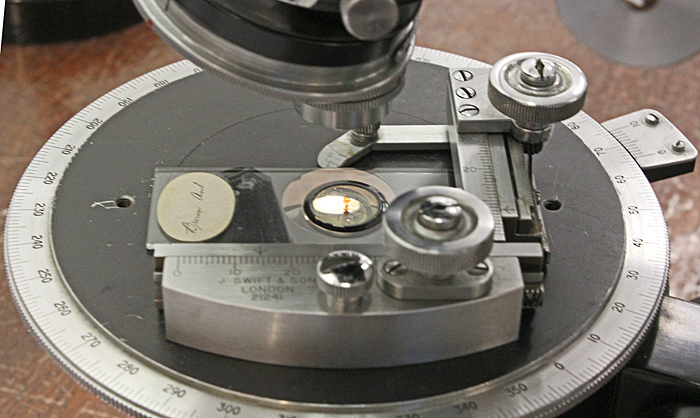 He used one of the Club’s Zeiss Standard microscopes with polariser and analyser, with his own Cellophane retarders (the same material used by Maurice Moss).